Evaluation of B- cells in general is facilitated by a wide variety of antibodies (20,21). The most commonly used antibody is CD20, an antibody directed at the surface molecule of B- cells involved in activation, proliferation, and differentiation. This antibody is robust in its technical performance and in its sensitivity and specificity for identification of B-cells. CD20 expression is limited in B-cell development; it is not expressed on the earliest B-lymphoid precursors (e.g., precursor B-cell ALL), and is also not expressed in plasma cells. New treatments based on monoclonal antibodies directed against CD20 molecule are regularly used in the treatment of B-cell lymphomas. Because of this, it is likely that many recurrences of lymphomas will downregulate the expression of CD20, lessening the usefulness of this IHC for this antibody in certain circumstances. There are other B-cells antibodies that are also quite useful. CD79a is a molecule that has a functional role in supporting and maintaining the surface immunoglobulin receptors on the surface of B-cells. It is expressed throughout the entire lifespan of B-cells, from the stage of early, committed B-cell lym-phoblasts, through immature and mature B-cells, as well as plasma cells. PAX-5, CD22, CD74, LN1/LN2 are other antibodies that are preferentially expressed on B cells, both benign and malignant (Fig. 11) (22-24). Plasma cell neoplasms are identified with great specificity and sensitivity by using CD138 (Fig. 12) (25). The follicles of the lymph node are home to the B-cell component of the immune response. Follicle composition, morphology, and cellular composition are affected by the state of the immune response. Fig. 11. Diffuse, nuclear expression of PAX-5 in this small B-cell lymphoma. Fig. 12. 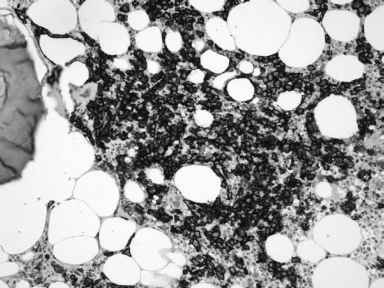 CD138 strongly stains plasma cells in this case of plasma cell myeloma in the bone marrow. Fig. 13. A follicular lymphoma showing strong CD10 expression in the neoplastic cells. 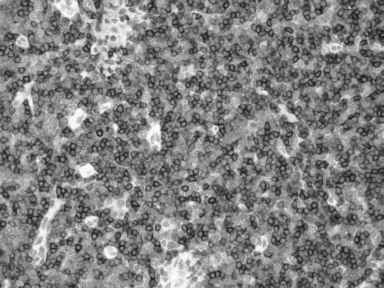 follicle center cells, it is also expressed on a subset of ALL, DLBCL, and Burkitt lymphoma. A proportion of the malignant cells in angioimmunoblastic T-cell lymphoma coexpress CD10 and T-cell antigens. Numerous antibodies reactive with T-cells have become available during the last decade. Among these, CD3 and CD2 are widely used as pan T-cell markers because they are expressed throughout the entire lifespan of T-cells, from the stage of early T-cell precursor lymphoblasts, through immature and mature CD4 or CD8 positive T-cells. CD45RO and CD43 antibodies, which were previously used extensively as pan T-cell markers, lack specificity and should not be considered as "first line" T-cell markers. 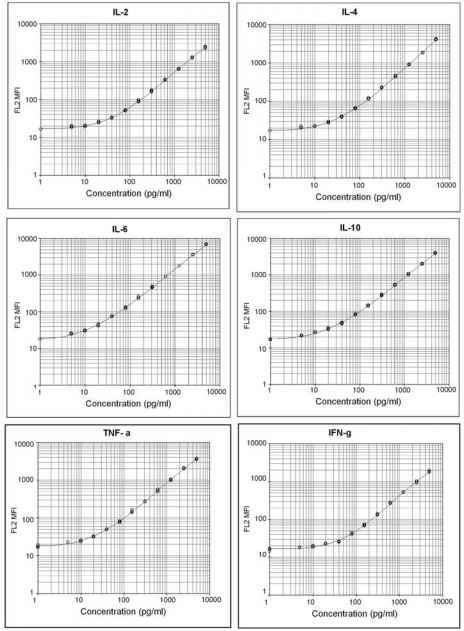 Other paraffin-reactive antibodies frequently used to characterize T-cell lymphoid malignancy include TdT, CD1a, CD5, CD4, CD8, CD7, CD30, Alk-1, CD56, and TIA-1. 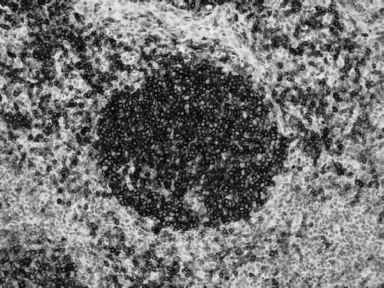 T-cell lymphomas are relatively rare and account for only about 10% of lymphomas in North America. T-cell lymphomas consist of a wide range of different clinical entities; however, most are classified in the general category of peripheral T-cell lymphoma unspecified. Fig. 14. T-cell lymphoblastic lymphoma with CD1a expression. CD1a expression is not seen in normal, mature T-cells. supportive findings of T-cell lymphomas are, in order of importance: the presence of T-cell clonality by molecular techniques, an aberrant T-cell immuno-phenotype (e.g., selective loss of T-cell antigen expression), a large numerical preponderance of a specific subtype of T-cells (either CD4 or CD8) or expression of CD1a or TdT (Fig. 14). Although each of these criteria is important, there are circumstances where each may be seen in nonneoplastic conditions, so individual features should be taken in the general clinical context. Precursor T-cell immunophenotype is decidedly abnormal except in very limited circumstances. Namely, they are normally found in the thymus. They are also found in thymoma. Precursor T-cell lymphoblastic lymphoma will often have expression of immature T-cell immunophenotype (11,30). This includes expression of TdT and often CD1a. The lack of CD4 and CD8 expression (e.g., seen in hepatosplenic T-cell lymphoma) or coexpression of CD4 and CD8 (e.g., T-cell prolymphocytic leukemia) are occasionally helpful in the differential diagnosis of T-cell lymphomas. Fig. 15. (A) H&E of a "hallmark" cell of anaplastic large cell lymphoma with (B) CD30 expression. Note the strong staining of the Golgi zone in this case. conditions (sinus histiocytosis). Malignancies that have a significant leukemic spread (e.g., leukemic disorders such as chronic lymphocytic leukemia) often cause an expansion of the sinus compartment as well as of the interfollicular areas. Other neoplasms with a sinusoidal tropism include lymphoplasmacytic lymphoma, anaplastic large cell lymphoma (ALCL), and metastatic carcinoma. 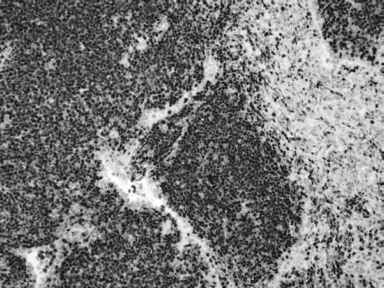 ALCL often, at least initially, involves lymph nodes in a sinusoidal pattern, which may simulate the appearance of metastatic carcinoma. ALCL is usually identified at least initially by its positivity for CD30. 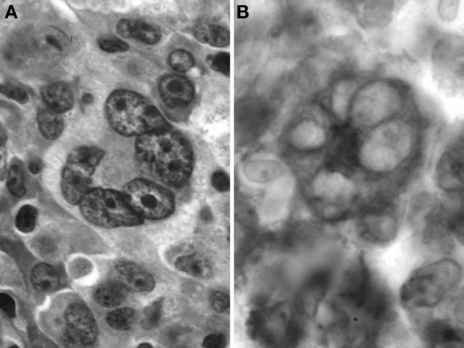 The staining is often membranous and cytoplasmic, sometimes with a Golgi pattern (Fig. 15). Although of T-cell derivation, ALCL only occasionally expresses a full complement of T-cell antigens. It is only positive for CD3 in about 50% of cases. They are most often positive for CD4, CD43, and TIA-1 (31). Although not required for diagnostic evaluation, the assessment of prolifer-ative and apoptotic activities can occasionally be of value in diagnosing lymphomas and in providing prognostic information (32-34). Fig. 16. Ki-67 expression in a case of Burkitt lymphoma. The near 100% proliferation rate helps to confirm a diagnosis of Burkitt lymphoma. By far, the most commonly used antibody to evaluate proliferation is Ki-67; also known by one of its more common epitope names, MIB-1. Ki-67 is a protein that is associated with cells in S-phase. As a diagnostic tool in lymphoma, Ki-67s use is relatively limited in routine practice. In the appropriate context, a proliferation rate of near 100% supports a diagnosis of Burkitt lymphoma (Fig. 16). 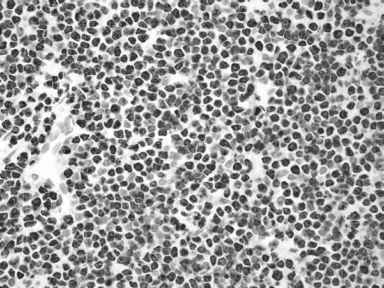 Ki-67 can also be used to evaluate other types of lymphomas, which have characteristic patterns of proliferation. Examples include foci of high proliferation in a background of diffuse, low proliferation can be indicative of a diagnosis of small lymphocytic lymphoma with proliferation centers. Likewise, the differential diagnosis of follicular hyperplasia would be supported by a high proliferation rate, whereas a low proliferation rate in follicles would be seen in low-grade follicular lymphomas (Fig. 17).